Bosch Professional has introduced two new 18-Volt cordless impact drivers that are flexible and efficient in confined spaces and hard-to-reach areas. The Bosch GDR 18V-200 C Professional and the Bosch GDX 18V-200 C Professional have the best performance-to-size-ratio compared to competitor models in the same category. Both tools have a maximum torque of 200 Newton metres and feature short head lengths of 126 or 147 millimetres respectively. Therefore, they are more powerful and compact than their predecessor models, and are designed for all connections in installations and in metal and wood work. In this area, they offer considerable advantages over cordless screwdrivers. The cordless impact drivers tighten common screws of size 6 x 60 millimetres faster, and also work recoil-free – the torque at the bit or screw is decoupled from the handle. Installers, carpenters or scaffolders can therefore operate the tools conveniently with one hand. This is particularly an advantage when working in small or confined spaces. 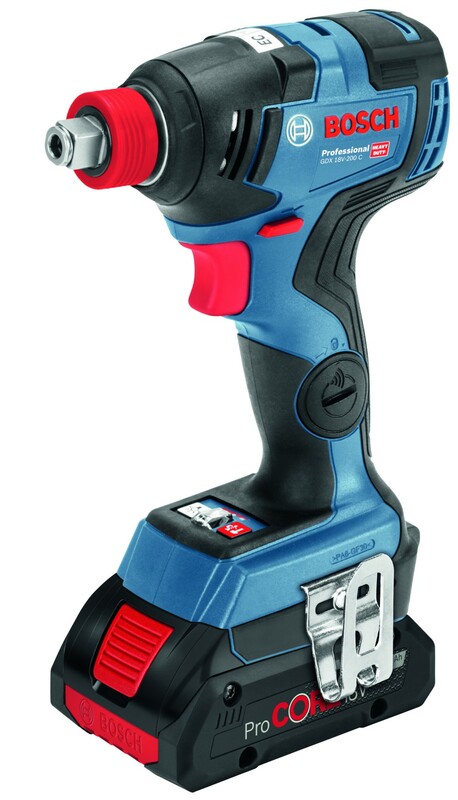 The cordless impact drivers differ by their toolholders, the new generation of the Bosch GDX 18V-200 C Professional also has a combined hexagon/square toolholder where both screwdriver bits and nutsetters can be used, increasing the versatility of this tool. The Bosch GDR 18V-200 C Professional and the Bosch GDX 18V-200 C Professional can be adjusted by the Bosch Toolbox app via Bluetooth to users personal settings. This includes functions such as soft start that enables a particularly well-controlled and precise tool positioning when screwing in wood. Maintenance has also become easier, tradespeople can receive information about the status of their tool straight to their smartphone. The app also enables repair orders to be sent faster, anytime, anywhere. Connected power tools and services from Bosch Professional provide the user with added value. Both cordless impact drivers have three pre-set speed settings meaning tradespeople can now work faster, and more efficiently. The preselected speed minimises the risk of over-tightening and snapping screws. The first setting is designed for small screws, the second for medium and the third for large screws. This corresponds, to driving screws in sheet metals, wooden boards and metal profiles. Further control is provided by the accelerator switch, which regulates the power individually. Both models are equipped with brushless motors for a longer lifetime and are operated by powerful 18-volt lithium-ion batteries. Those who place a value on light weight with a high output can turn to the new compact high-performance battery ProCORE18V 4.0 Ah. Thanks to new higher-capacity cells, it is single-layered and is thus considerably smaller and more compact than the two-layered standard battery with 4.0 Ah. Previous : The Golf Classic tees up for another exciting year! Next : Do you want to grow your business?